“Nobody should be alone at this point,” Meaghan said. Why was I so worried? To begin with, the northern Cascades have a jagged, forbidding quality about them that reminded me of the White Mountains in New Hampshire. But the much more important issue is the snow. “Be through before October 1st,” speaker after speaker had advised us thru-hikers at the PCT Kickoff in late April. Well, that was good advice. But some of us had trouble making it from Mexico to Canada in five months. So come early October of 2009 we were still digging away. I was down over 40 pounds in weight from an already lanky frame, which was anything from problematic to dangerous. And I had a history of getting lost. At times like this, Old Lady Luck come into play. After some diabolical weather for ten days, the forecast showed a window of good weather for five days. That was exactly how long it would take me to get from Stehekin, the last trail town, to Manning Park in Canada. I set off with strong emotions from Stehekin, knowing the margin of error was not great. Fortunately I drew snake eyes; the weather remained cool and clear. But by the time I got to Canada, the bottom was on the verge of falling out. I was exhilarated to be sure. But also sobered. The weather in northern Washington has been virtually diabolical the last week. The article recounts that two hikers were rescued from the heavy snow. But two others are missing. They tried to rescue the other two, following their GPS signals, but had to turn back because of the heavy snow. Having traversed that area, it’s easy to see how this could happen. This area gets the single greatest amount of precipitation of any area in the contiguous United States. I remember some of my colleagues–CanaDoug and Little Buddha–getting caught in deep snowdrifts and being lucky to bail out. It’s very difficult to follow the trail in these conditions, for the simple reason it is nonexistent. So what drives people to stick their necks out like this. “It was impossible to imagine coming all the way from Mexico to Canada,” said one of the rescued hikers, “and not finishing the hike up.” We can all surely understand that. However, I urge hikers to consider just how important the journey is. The Pacific Crest National Scenic Trail is one of the two greatest footpaths in the world, along with the Appalachian Trail. It will always be there. And long-distance hikers are not mountain climbers, who are practically expected to find themselves in life-threatening situations. There is plenty of adventure to be had without tilting at windmills. Right this moment, there are apparently around 50 thru-hikers at the renowned Dinsmore hostel in Skykomish, Washington. These are great folks. I can see Jerry telling them in his no-nonsense manner, “You should not try to get over Glacier.” He is referring to Glacier Peak which may be the snowiest part of the entire northern Cascades. Hikers will thus have to resort to taking the ferry to Stehekin (there is no other way to reach it). The consolation is that the ferry travels through some almost insanely beautiful surrounding on Lake Chelan, the third deepest lake in the United States. My hat is off to the PCT class of 2013. They have had a great trek thus far. This one diversion will not materially alter what has probably been the journey of their lifetimes. As for the two missing hikers, our prayers are with them. And my money is on them, having gone this far, to have the wherewithal to find their way out of their currently frightening predicament. 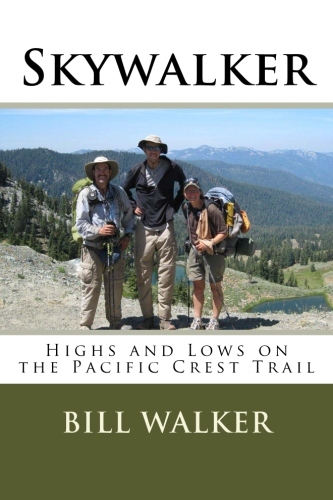 Bill Walker is the author of ‘Skywalker–Highs and Lows on the Pacific Crest Trail‘. He is also the author of ‘Skywalker–Close Encounters on the Appalachian Trail’, ‘The Best Way–El Camino de Santiago‘, and ‘Getting High–The Annapurna Circuit in Nepal’. Walker, who is 7-feet tall, is currently working on a whimsical book on the subject of height.